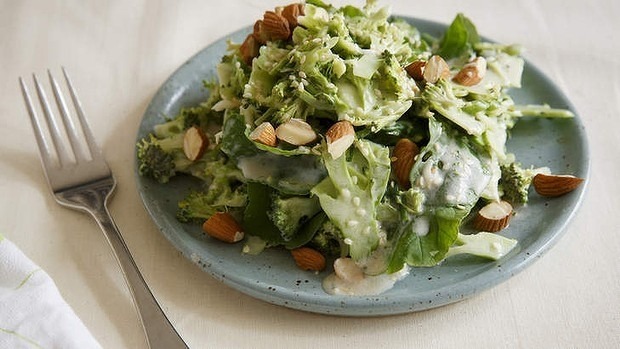 Pair this salad with a roast dinner for a fantastic family feast.Use the freshest broccoli you can find for this salad. The dressing is also fantastic with baby cos salad or spinach and avocado. Watch your fingers on the mandolin! Heat the oven to 180C. Spread the almonds over a baking tray and toast until slightly golden, about five minutes. Leave the nuts to cool then roughly chop them. Thinly slice the broccoli stalks (peel them first if you prefer) lengthways on a mandolin into a bowl, then slice the florets into the bowl. Slice the broccolini lengthways into the same bowl, add the onions, rocket and half the almonds. For the dressing combine the buttermilk, vinegar, lime juice, olive oil and garlic paste in a jar and shake vigorously until well combined. Season to taste and dress the salad well, tossing it until fully coated. Serve scattered with chopped almonds, sesame seeds and freshly ground black pepper. Serving suggestion: Serve with Frank Camorra's miso-roasted pork neck.